SEATTLE, WASHINGTON (October 16, 2017) -- Northwest Mountain MSDC President and CEO rendered a presentation on Supplier Diversity at the 74th Annual Pacific Northwest Purchasing Conference hosted by the Institute for Supply Management (ISM). The presentation contained essential information for procurement executives to understand the definition, importance and effective management of supplier diversity. The full presentation is available for viewing on the Council website, www.nwmtnmsdc.org/supplier-diversity-presentation. What is and is not Supplier Diversity? To request a PDF version of the presentation, please contact the Council at 253-243-6959. The Council presentation by Fernando Martinez during the 2017 Annual Awards Dinner & Silent Auction is now available for viewing and download at the Council website, www.nwmtnmsdc.org/2017councilpresentation. Event images and more post-event updates will be released next week. Stay tuned! 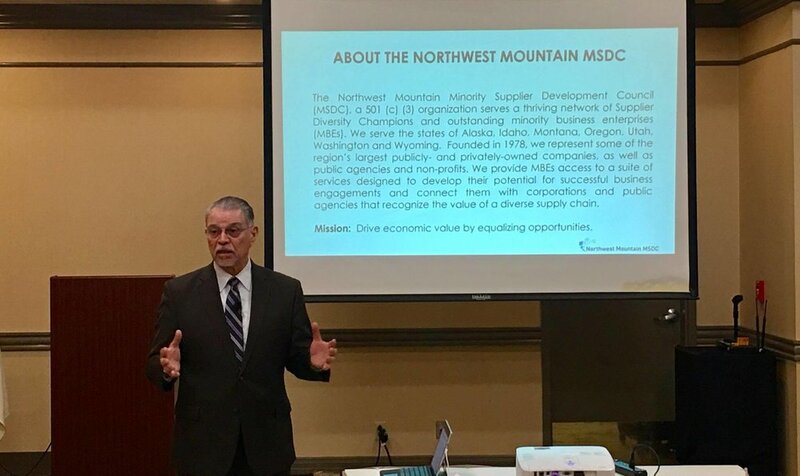 Richard A. Retzer, guest speaker at the Northwest Mountain Minority Supplier Development Council (MSDC) 2016 MBE Meeting, presented his unique perspective on business “Science of Growth” – an in-depth analysis on the lifecycle of businesses and methodology for success.